Reservations are essential to see The Last Supper with online advance purchase tickets the cheapest and simplest way to ensure timeslot admissions. 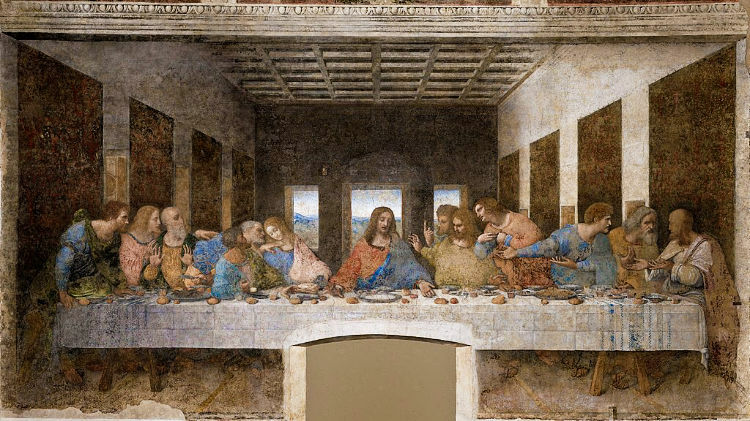 Tickets for The Last Supper in Milan must be bought in advance as Leonardo da Vinci’s famous painting on a wall in the refectory of the Convent of Santa Maria delle Grazie in Milan may only be seen with reserved tickets. All admissions to The Last Supper Museum are in effect skip-the-line tickets, as only 30 visitors per tour are allowed to spend a maximum of 15 minutes viewing the painting. Guided tours of The Last Supper are pricy but do ensure admission on specific days and times when the ticket-only option is sold out. The simplest and cheapest way to buy tickets for The Last Supper is on the official website of Cenacolo Vinciano at Vivatiket – the site is very old fashioned and looks a bit turn of the millennium but it does the job. English is available but depending on the browser may be less easy to find. The Last Supper Museum website shows the dates and times for which tickets are available. Online tickets for The Last Supper go on sale in two month time periods usually around two to three months in advance. Tickets sell out fast even outside the high season (but cancelled reservations may be added again later). Note that it is currently necessary to first register with an account before it is possible to reserve a ticket, or to see how many tickets are available at any given time slot. Also the name of the person using the ticket is required not the name of the person buying the ticket. It is only possible to buy a maximum of 5 tickets online. Check the website again closer to the time of visit. Tickets may be returned, especially from tour groups and resellers, and may become available at short notice. During the low season, it is often easier to buy tickets a few days in advance than a few weeks in advance. Splitting groups and even couples up may be a way to get the last tickets on different time slots. Phone the call center (+390292800360 or 800990048 when calling from inside Italy), which is also the only way to reserve tickets for free Sundays. Enquire at the ticket window in person. While it is not possible to queue up for tickets, cancellations by tour operators may occasionally free up reservation slots for later the same day. Buy tickets as part of a group tour through resellers – this will come at a price but will ensure admission. The cheapest options are guided tours of The Last Supper that could be an hour but also as short as 45 minutes or even only 30 minutes. These are basically a simple walkthrough and guided description of The Last Supper. It usually adds some value but for many the only real reason to use these tours is to ensure admission on a specific day when the official tickets are sold out. Many tour operators offer these tours but availability differs quite a lot – a search with specific dates is a good start. There is not much variety in prices or on what is included in these short tours. Longer tours adding further sites are more expensive but may offer more value for money and often are available in higher numbers and on more dates. Some further sights added on these tours are for example the adjacent Santa Maria della Grazie church, the nearby Church of San Maurizio al Monastero Maggiore, sometimes called the “Sistine Chapel” of Milan, skip-the-line access to the duomo (cathedral), La Scala opera museum, further art treasures, Da Vinci sights such as the codex atlanticus, or combination tickets with a wine tasting or dinner. Read the fine print, as some tours are only a guided talk leaving visitors to explore the final sights on their own. Also transportation other than walking is often not included in these tours. An after hours night time visit with dinner gives a full 30 minutes with The Last Supper followed by a dinner at Eataly – a pricy option with limited dates but a rather special experience too. Access to Leonardo da Vinci’s The Last Supper on a wall in the refectory of the Convent of Santa Maria delle Grazie in Milan is strictly controlled. Only 30 people at any given time are allowed into the room and visitors may only stay in the room for a maximum of 15 minutes. Returning is not possible. The 15-minute limit applies to all visitors irrespective of how the ticket was purchased. The limit is very strictly enforced making it worth being a bit pushy if people are tardy to enter. 15 minutes are short, although some visitors spend less time than that in the Sistine Chapel in the Vatican. On the opposite wall of Leonardo’s masterpiece is the huge fresco of The Crucifixion (1495) by Giovanni Donato da Montorfano. At least give it a glance on the way out. Pick tickets up at least 20 minutes before the admission time. Bags must be placed in lockers before entering the refectory. Admission tickets for the Last Supper Museum in Milan are €10 but as advance reservations are essential the €2 advance booking fee should be added. The €2 advance booking fee also apply for children under 18 who otherwise have free admission and young European Union and EEA nationals (18 to 25) who pay €5. At some times, the official guided tour is given, which adds €3.50 to the admission ticket. At these times – currently 9.30 and 15:30 in English and 10:00 and 16:00 in Italian – the tour price is automatically added and good value for money. Admission is free on the first Sunday of the month but an advance reservation by phone only (with €2 advance booking fee) is still required. In contrast to many other free sights, there is no reason to avoid The Last Supper on a free Sunday, as the number of visitors is the same as on regular days (but good luck on scoring a reservation in the first place). The Last Supper Museum is open Tuesday to Sunday from around 8:00 to 19:00 but only the 15-minute of reservation time is really relevant. Occasionally, expensive after hours tours are possible.